Product information "Smeg TSF02PBUK 4 slice retro style toaster in Pastel blue"
Tasty toast and beautifully browned bagels are only moments away with the Pastel Blue retro styled Smeg TSF02 4-Slice Toaster.With four functions, you'll be able to enjoy fantastic toast in the morning. Whether you need to defrost frozen bread, reheat a previously toasted slice, or brown a bagel to perfection, this toaster is up to the task.Six levels of variable browning allow for all tastes in level of toasting to be catered for, while self-centering racks make sure that every slice is evenly toasted on both sides.A removable crumb tray is fitted and makes it simple to clean and maintain the toaster.With a great looking retro design that compliments other items in the Smeg range, you can add a touch of class to your toast making with the red Smeg TSF02 4-Slice Toaster. 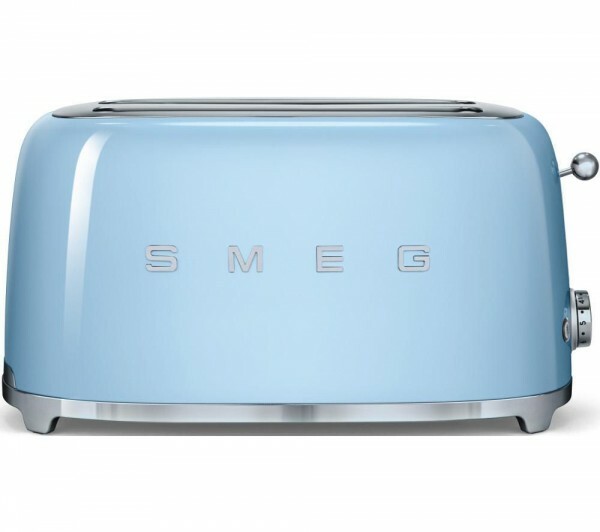 Related links to "Smeg TSF02PBUK 4 slice retro style toaster in Pastel blue"
Customer review for "Smeg TSF02PBUK 4 slice retro style toaster in Pastel blue"